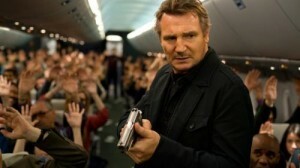 Liam Neeson (Taken 2) fights bad guys 40,000 feet in the air in Non-Stop. Neeson plays U.S. Air Marshal Bill Marks, who receives a series of cryptic text messages saying that a passenger will die every 20 minutes unless $150 million is transferred into an off-shore account. Trying to protect hundreds of people and keep the plane safe, Neeson’s Marks must do everything he can to find the killer. Neeson partnered again with his Unknown director Jaume Collet-Serra for the movie, which also stars Julianne Moore (Don Jon), Michelle Dockery (TV’s Downton Abbey), Scoot McNairy (Argo) and Shea Whigham (TV’s Boardwalk Empire). Rateed PG-13, Non-Stop grossed $90 million in theaters, with critics rewarding the thriller movie with decent reviews, according to Rotten Tomatoes. Universal Studios added just a couple featurettes on the DVD and Blu-ray. On both is the behind-the-scenes featurette “Suspense at 40,000 Feet,” with the cast and crew discussing the making of the film. The Blu-ray adds “Non-Stop Action,” showing how the movie was shot in a 20-foot by 30-foot set the shape of a tube. The Blu-ray also has a digital copy of the film.